Hold on, because this one’s a bumpy ride (but isn’t it always, in Colombia?). Every year, approximately from July to October, hundreds of humpback whales migrate along Colombia’s Pacific coast. They are most active and visible in August and September, so when the Colombiano suggested we go to see them, I was of course on board. The tricky thing is that, to see the whales, you have to go to Buenaventura, Colombia’s major Pacific port, which is (as anyone here will promptly tell you) the most dangerous city in Colombia. 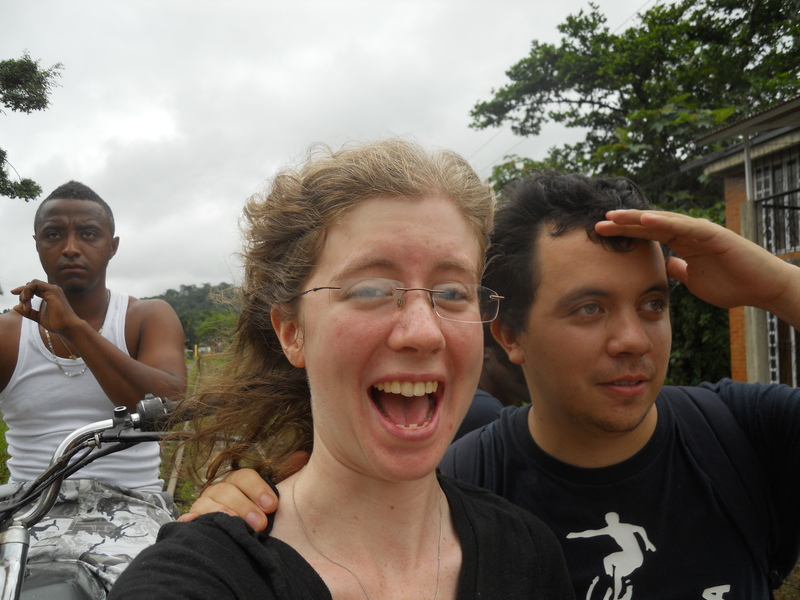 Colombians, upon hearing that you are traveling to Buenaventura, will inevitably react in one of two ways: they will force a smile and say, “That’s nice;” or they will gleefully mime getting shot or decapitated with a friendly laugh. So that’s reassuring. We decided to extend the trip to see more than just Buenaventura, so early on a Friday morning, it was back to the jungle for the Gringa and the Colombiano. This time it really was the jungle. We set off on the bus to Buenaventura, intending to get off about a half hour from the end of the route to get to our destination. Now, if you look at a map, the distance from Cali to Buenaventura doesn’t seem that great. It is only 127 kilometers. So why, you may wonder, does the bus supposedly take three hours? Surely, you think, that must be an overestimate. But if you think that, you clearly have still learned nothing about Colombia. There is one road from Cali to Buenaventura, and it twists and curves through valleys and mountains. The fearless drivers of the minibuses that run this route, however, take no note of the twisting, treacherous mountain roads. The good thing about Colombian drivers is that they want to get you to your destination as fast as possible. The bad thing is that they want to get you there as fast as possible. This often means swerving onto the wrong side of the road, speeding in front of a long line of vehicles ahead, and (hopefully) careening back onto the ride side of the road literally just in time to avoid a horrifying collision. Seriously, you better hold on. After two hours of driving, we found ourselves in a seemingly endless line of standstill traffic. What was so unusual was that it was a literal standstill; the line did not move an inch. 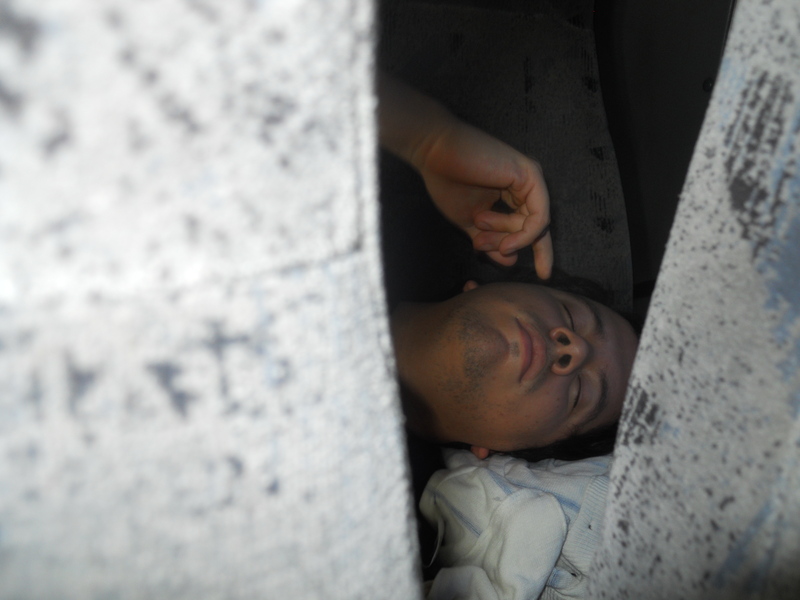 Finally, we decided to ask our fellow passengers what was going on. They explained that the road ahead had three tunnels that passed through the mountains; the tunnels were only one lane, so we had to wait. This did not make sense, I thought; if there was only one lane, surely we would move more slowly, but we would at least move. But I suppose I briefly forgot that this is Colombia. Our fellows went on to explain that no, one lane does not mean one lane going in each direction; one lane means: One. Lane. Because of course it does. They close the traffic in one direction, let a long line of vehicles pass through, and then approximately (though not realistically) every hour they change the direction of traffic. So, about four hours after leaving Cali, we arrived in the place that was supposed to be two hours away. I thought I was ready for an adventure, but nothing could have prepared me for the method of transportation that awaited us. This, my friends, is a brujita (Spanish for “little witch”). It is a wooden platform with benches, attached to a motorcycle. The motorcycle’s rear wheel runs on the train rail. So we plopped ourselves on the bench and, once again, held on. It honestly feels a bit like a rollercoaster speeding through the jungle. It goes surprisingly fast, and once you get over the initial shock, it is a fun ride. San Cipriano, our destination that day, is a nature reserve, so there are no roads to get to the village; the brujita is the only way in or out. It is actually a rather ingenious way of utilizing the little-used train tracks that are already there with the resources on hand. The village of San Cipriano sits alongside a pristine, crystal-clear river. 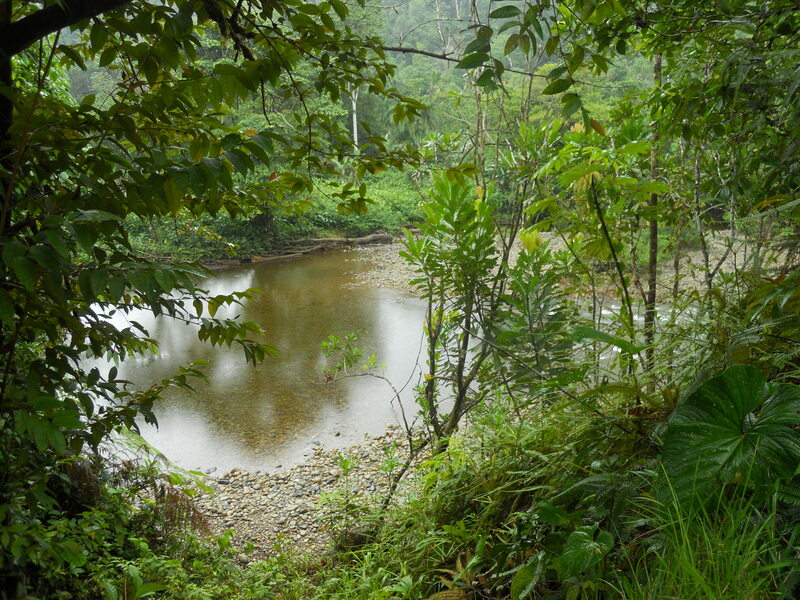 Along the river are a series of charcos, natural pools that are deep enough to swim, jump, and dive in. It was a refreshing change from the heat of Cali, and the scenery was absolutely beautiful. The jungle, however, was not entirely kind to me. Despite layers upon layers of my mother’s supposedly industrial-grade insect repellent, I was repeatedly attacked by the creatures of the jungle, including swarms of mosquitos and some extremely persistent bees. We spent an enjoyable and muddy day in San Cipriano. That night in the hostel, I got practically no sleep, courtesy of the nightmare rooster and nightmare dogs that kept me up all night with their constant crowing and barking. On Saturday morning, it was back to the brujita and out of the jungle as the journey continued. 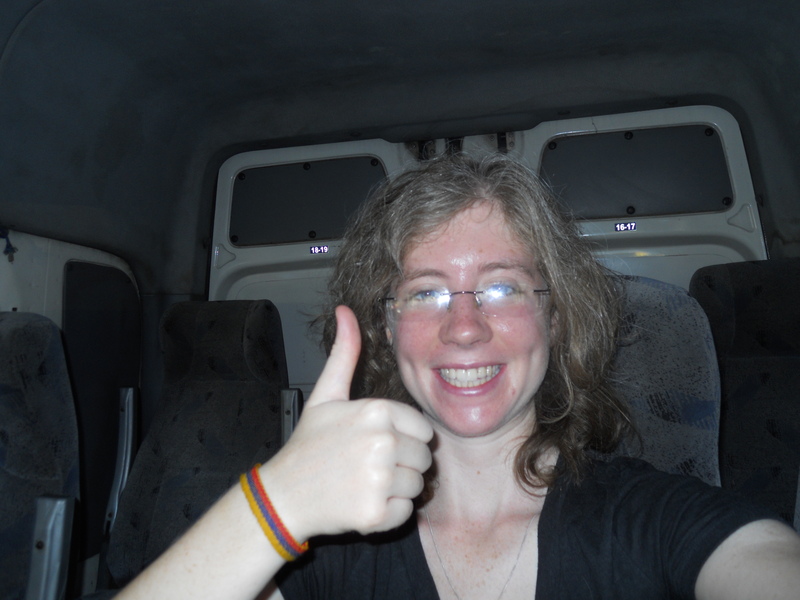 After (naturally) some very long delays, we managed to find the correct minibus to take us on to Buenaventura. I’ll just say that Buenaventura looks exactly like I pictured it would, and other than going to see the whales, I wouldn’t recommend a tourist visit. We went directly to the docks, where we purchased our very expensive boat tickets, and were told that the boat leaves every 15-20 minutes. Ha, right. After waiting for well over an hour on a sweltering dock, they finally began to load the boat, five people to a row that was surely only meant for four. After they packed us in like cozy little sardines and made us wait another 20 minutes (for good measure), the boat finally left. And this being Colombia, it was a wild ride. It was not a particularly new vessel, and from the creaks and clatters it made, did not sound particularly safe. The boat sped through choppy seas for 45 minutes, often catching surprising air off of the waves and coming back down to the sea with a harsh jolt. 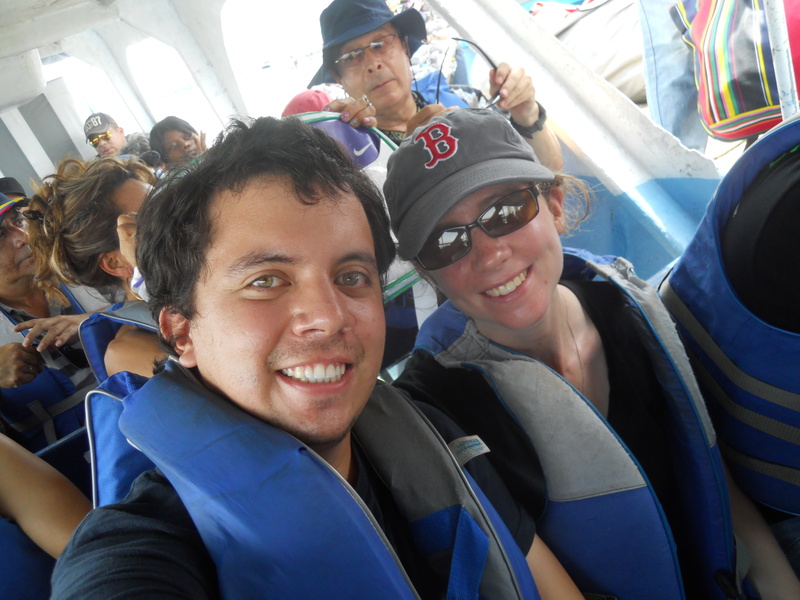 It was quite an experience to hear everyone on the boat simultaneously yell “¡AY…AY!” as the boat took flight and then came back down, slamming us repeatedly onto the hard wooden benches. Finally we arrived at our island destination, and those disembarking had to climb over the seats and jump onto the wharf as the boat bobbed in the waves. We stayed on the boat until it left again in search of the whales (and my sailor friends will be proud to note that I called “last line” because I am well-trained). It did not take long to find the whales, and they were well worth the long and winding road from Cali. 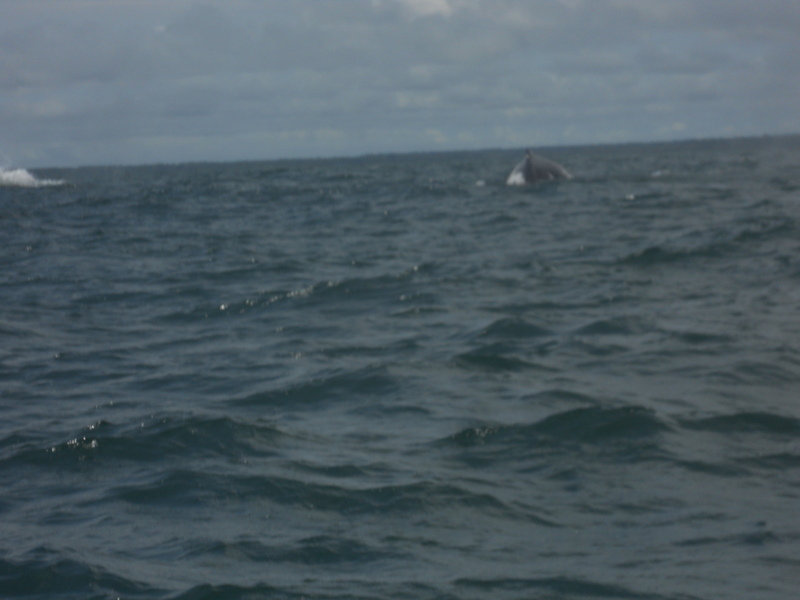 We saw a mother and baby, as well as a very large pod of at least six or seven whales traveling together. It was beautiful, and the pictures cannot do it justice at all. The rest of the day was, of course, filled with delays. 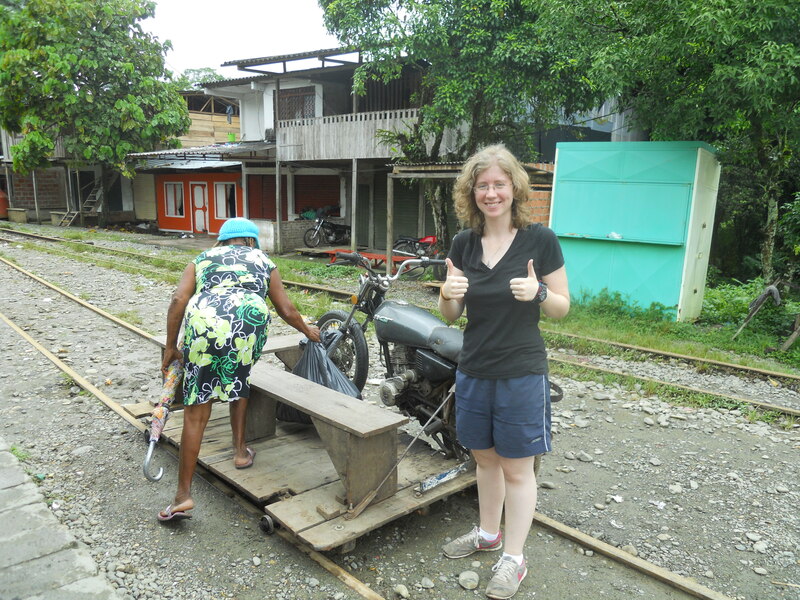 We had to wait for about two and a half hours on the island before getting the boat back to Buenaventura, and then we went directly to the bus station. Outside, an employee approached us and forced us to wait outside on the street corner while he called back the Cali bus for us. This time, our fearless driver was not so keen to get us back quickly; he made several stops and got out from the bus to gossip with strangers on the street and, once, in a bar. You can’t make this stuff up. After a harrowing ride through the foggy mountains in the dark, we finally made it back to Cali, thankfully in one piece and with nothing worse than insect stings and a few nasty bruises to show for our trip to the most dangerous city in Colombia. Mate Yeoman, you are SO SALTY!